I found this out of place rock in the South-Eastern Oregon desert a couple months ago. 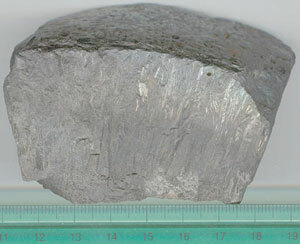 It is very heavy and has an extremely weak but present attraction to magnet. It doesn't look like any of the meteorites I've seen but the magnetic attraction and the rounded surface crust make me wonder. What do you think? For all my experience in researching old mines and old furnaces, it is trough plug from a foundry operation. Some foundries, especially older ones that didn't have overhead cranes and large crucibles have channels in the floor from the furnace to a bank(tree) of molds. The molten metal was released into any of several brick, sand, or clay-lined channels at the the "tapping hearth" and flowed out into the castting floor/ house/ room to the ingot molds (pigs)*. Slag was drawn off first. Not to be confused with furnice plugs or taps which were ceramic clay and broken to release the molten slag or metal, these plugs stemmed from an overflow in the channel and had to be cleared when cooled. If they "graded in" they went back into the next charge if they "graded out" they were tossed or sold to shipping lines to be used as ballast on ships. This is about the right width and shape in cross section for a typical channel although it could have been from a pig which graded out. The top to bottom zoning suggests a plug. The reason it looks like a loaf of bread on top is that metal tends to be highly cohesive and has a convex(rounded) meniscus. In case anyone ever runs across metal "cow patties"-- these are another foundry artifact and are splash forms which actually splattered when being poured. I don't remember what they were nicknamed. I frequently find them in old railroad right of ways. Your item is possibly high in zinc, as there is little oxidation, and/or "pot metal", which is a low grade assemblage of whatever came into the reclamation pile that month, or slag residue. 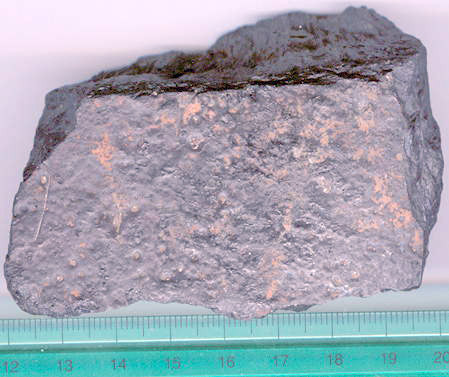 Slag is a generic term but usually contains more silica/ glass than metal-usually no free metal. This section appears to be more metal than slag/glass. 99% certain it is not a meteorite and it would take a long time to point out all the reason's why. Keep looking at photos enough and it will make more sense. If you read the descriptions now in use as to what is or isn't a meteorite just about anything can "look" like a meteorite. At least photos can help screen some items. * Tradition says the the term "pig" came from the arrangement of the ingot molds off the channel, which reminded the smelters of a sow pig nursing a litter and is the origin of the term "pig iron".